With the Dallas Maverick's win on Friday, the Lakers draft pick is potentially slotted at number three. If it remains in place at the end of this season, what would the Celtics do with that acquired pick? The emergence of Oklahoma's Trae Young into BeacherReport's top-5 has made things more interesting. Young is putting up amazing numbers lately and leads the nation in both scoring (28.7) and assists (10.4). He is ranked at number four, but he lacks size and explosiveness. There will be NBA teams in the high-lottery area that will have visions of Stephen Curry in their heads and will grab him. But Arizona's DeAndre Ayton is still the headliner and ranked number one on BleacherReport's rankings. He is a definite scorer, rebounder and shot blocker who stands 7'1" with a 7'5.5" wingspan. He can score in close or from distance and hits a respectable percentage on free throws (70.8%). If you missed it last night, with Dallas' win the Lakers now own the 3rd worst record in the NBA. The 3rd worst record would give them the best chance (80.4%) of landing a pick between 2 and 5 in the draft. A Laker pick between 2 and 5 in the draft...goes to the Celtics. As long and as good as this guy is, the Celtics usually favor players with versatility that can play two or three positions, and even at 7'1", Ayton should be able to play PF/C at the NBA level. Make no mistake. Look at the above photo. This guy is a physical specimen with high-level talent. But he could fall to number two or three in the draft and be available to Boston, if indeed the Lakers pick is either second or third. European Luka Doncic has size (6'8") and versatility. He can play positions 1-3 but lacks athleticism. His herky-jerky moves are reminiscent of Paul Pierce without the explosiveness. Marvin Bagley of Duke University is slotted at number three. He is a 6'11", 235-pound PF/C who can score (21.2 points) and rebound (10.9) but not known for stellar defense. Michael Porter, Jr. and Mohamed Bamba come in fourth and sixth. Porter underwent back surgery which is a concern, and Bamba is still raw but has amazing length and defensive ability. Danny Ainge has personally scouted Ayton, which is a sign that he may have a tentative plan for that Lakers pick should it pan out. 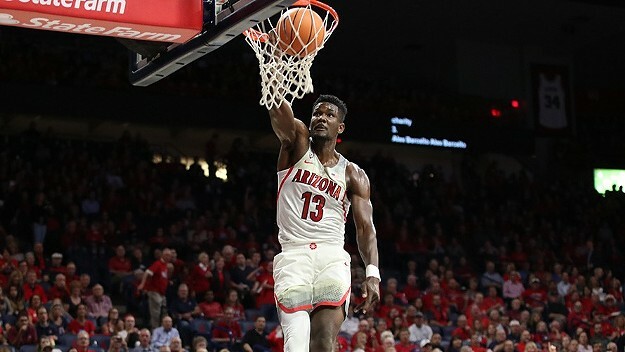 If he feels Ayton can play both center and power forward effectively at the NBA level, he may take him if available. Doncic and Bagley might also be under consideration. The major question relative to Bamba is his shooting. Can he develop into a reliable scoring threat at the NBA level? Ainge's other option (big surprise here) is to use the draft pick as a trade chip. The Celtics can certainly use another productive and versatile big man. The Clippers and Grizzlies are faltering, but I don't see Danny going after DeAndre Jordan or Marc Gasol. You know what's coming. I have said repeatedly that Danny Ainge covets certain players. I doubt he was focused on Kyrie Irving until the grumbling was heard in Cleveland. But when the noise started, Danny's mind went into high gear. He still wants Anthony Davis but New Orleans's mindset is not focused on trading him. But if the right package was available, things might change. Everything is for sale, even if the owner persists it is not. I will get into Davis' potential fit with Boston and the four Celtics players that I view as keepers in Part 2. The halfway point in the season is upon us and the trade deadline is looming. Fasten your seat belts. Danny in high gear can be exhilarating.